There is a definite chill in the air, and the first snow flurries are flying… that means it’s time to get our snow blower prepared for the winter. Basic snow blower maintenance is fairly simple and straightforward, involving steps similar to those you’d take for your car (changing oil, inspecting belts, and so on). The first step is to dig out the owner’s manual, so that you know exactly what replacement parts, oil, and lubricants are right for your specific model of snow blower. Following are some general guidelines that should have you up and running before the first heavy snow. Check all of the nuts, bolts, screws, belts and cords to make sure that nothing is loose. Two-stage snow blowers have two belts, one for the auger and one for the drive; single-stage snow blowers have only one belt. If the belts are worn or cracked, they should be replaced. Otherwise, make sure they are tight. The starter cord also should be inspected and replaced if there is any evidence of fraying. A two-cylinder engine uses mixed gas and oil; a four-cylinder engine uses straight gas with a separate crank case for the oil. In both cases, you should completely drain the old oil and gas from the engine and replace with new fluids. To change the oil, start the engine and let it run for a few minutes to warm up. 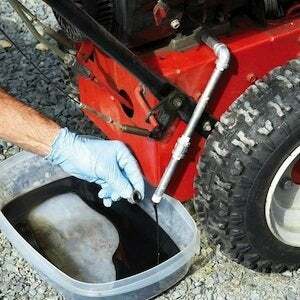 Stop the engine and remove the oil plug, draining the old oil into a waste receptacle. Once all the oil has drained, replace and tighten the plug and refill the engine with the appropriate weight of oil. Turn the engine on again and check the oil level. Also, check to make sure that the drain plug is tight and there are no leaks. Check your owner’s manual to ensure that you have the proper replacements on hand. To change the spark plug, remove the lead wire, then use a socket wrench to remove the plug. Replace with a new spark plug, being careful not to over-tighten the new plug, and re-attach the lead wire. Again, check the owner’s manual to ensure that you use the proper lubricant. If possible, turn the snow blower on its side so that you can easily reach all of the components. While the snow blower is on its side, inspect the scraper bar (the piece that rubs against the ground and scrapes the snow off.) If this is worn, replace it (leaving it alone could result in damage to the snow blower housing). At the same time, inspect the skid shoes, which are located on each side of the auger housing. The skid shoes adjust the height of the auger in order to keep it from scraping the ground or picking up stones. Skid shoes should be replaced if they are worn. Also check the rubber on the auger—if your finger fits between the rubber and the housing, it is time to replace the rubber. Check the tire pressure and add air if needed. Visually inspect the tires for wear; replace if necessary. If you have chains for your tires, either put them on in advance or make sure they are readily accessible. The shear pins (also known as shear bolts) on a snow blower are actually designed to break. Shear pins are an important safety feature, because they break when the auger and casing are over-torqued and prevent serious damage to the unit. The shear pins are located between the auger and the gear casing. If any pins are missing or broken, replace them. It is a good idea to buy extras, so you have them on hand during the winter. Different makes and models of snow blowers come with various accessories, such as power steering, headlights, and electric starters. It is a good idea to inspect all of these items and replace any accessories that are broken or worn. 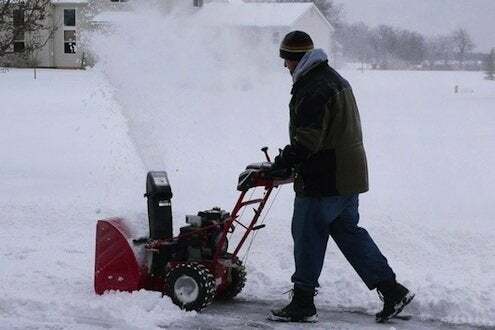 There are a few things to keep in mind during the season: Always run the snow blower on a cleared surface to remove any leftover snow from the auger and, before you put it away, wipe snow from the throw chute and the housing. 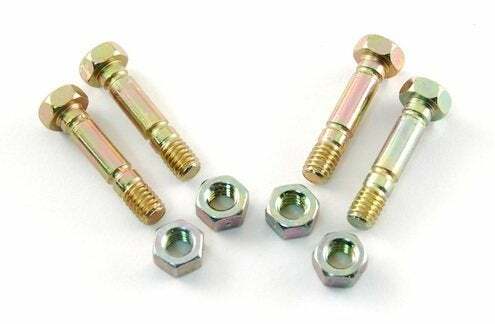 Tighten any loose bolts or fasteners after each use. Check for worn or damaged parts and replace as soon as possible. Remember that just a few minutes of simple maintenance will keep your snow blower in tip-top shape, ready for winter’s worst!